William Tecumseh Sherman is one of the U.S. Civil War's most controversial figures. A "Fierce Patriot" (in the words of Sherman biographer Robert O'Connell), Sherman deserves more credit for holding the United States together than anyone save Lincoln and Grant. His tactics left the South in smoldering ruins. Yet, in the years leading up to the war he resided in the South, helped to found the Louisiana Military Academy, and sympathized with Southerners politically - except on secession. How could a man who counted dozens of Confederates among his closest friends go on to become the most hated man in the South? Simple, Sherman was a soldier first, and he fought to win. Whether subduing Georgians, Sioux, or Seminoles, Sherman didn't pull punches. In Sherman's mind, War is Hell, and the primary objective is winning quickly and decisively. In Part 1 of our portrait of William Tecumseh Sherman, we look at 'Cump's childhood, West Point time, early military career, role in the California Gold Rush, and clear-headed predictions about what to expect when the North and South finally came to blows. 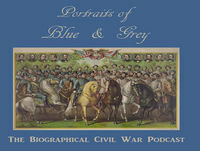 If you have any questions or comments about this or any other episode, you can reach Portraits of Blue & Grey at BlueandGreyPodcast@gmail.com. Thanks for listening!